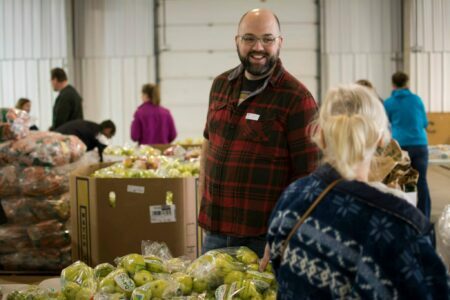 Sourcing healthy food and produce is the first step to filling our neighbors tables with more nutritious meals. The Food Bank sources food from manufacturers, retailers, food brokers, farmers and government entities. The Food Bank rescues donations of surplus from farmers, food wholesalers, distributors, manufacturers and through our partnership with Feeding America. As a result of federal surplus-removal and price-support programs, the United States Department of Agriculture (USDA) purchases excess food produced by American farmers. The USDA utilizes a number of commodity distribution and nutrition programs to provide these excess commodities to low-income Americans and some of those commodities are distributed through the Food Bank. Individuals, community organizations, schools and corporations host food drives to collect food for our neighbors. We work with retail stores to rescue donated product that would otherwise go to waste. In 2018, 285 retail stores donated more than 8 million pounds of food, more than half of which went directly to our member agencies. The Food Bank also collects more than 2.3 million pounds of fresh, donated food from local Pennsylvania farms. In the past two growing seasons, we harvested nearly 100,000 pounds of produce that otherwise would have gone to waste during 36 gleaning sessions at local farms. Check out a map of our glean partners! The Food Bank purchases 31 percent of the food we distribute. The Community Table program connects local restaurants with food assistance agencies to provide more than 173,000 meals annually.